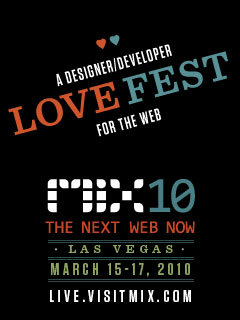 This weekend i am headed to Vegas for a week of designer/developer love. I plan to spend a lot of time in the phone sessions as well as in the Commons visiting with people. This year's MIX has be really excited about both Silverlight 4's continued maturation as well as the XNA/Silverlight 4 story on the phone. I really want to connect with designers who have spent a year with Sketchflow and see how the tool is working in their 'day jobs'. Building Silverlight apps is one thing, but what happens when you get stuck? That's where debugging comes into the picture. In this mini-talk, Shawn shows you how to do simple debugging of Silverlight code, debug data binding/validation problems, and how to debug Windows Communication Foundation (WCF) Services. This is a twenty-five minute talk where I hope to help you figure out some of the debugging mysteries of Silverlight. Come hear how to protect Silverlight applications from common threats including securing your application from intruders, eavesdroppers and users as well as protecting your code, your data and your servers from attacks. Also, hear about the key security vectors that must be considered when using Silverlight such as securing applications that often live outside firewalls. During the rest of the conference I will be around and at as many parties as possible...it is Vegas after all. If you want to find me, either follow my tweets, my FourSquare checkins or my Glympses (see my Twitter feed for Glympse notifications).